In 1953, the Swiss Blancpain SA watch company was commissioned to construct a diving watch for the French Navy Combat Diver School. The watch was a collaboration between then Blancpain CEO Jean-Jacques Fiechter and French Naval Officers Captain Robert Maloubier and Lieutenant Claude Riffaud. 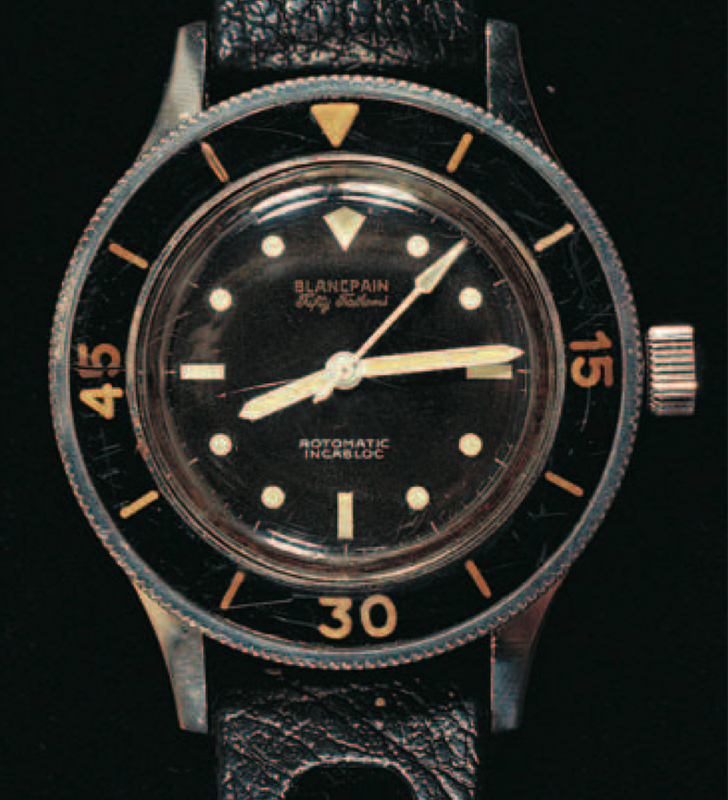 The Blancpain Fifty Fathoms watch predated the Rolex Submariner and Omega Seamaster (as a dive watch). 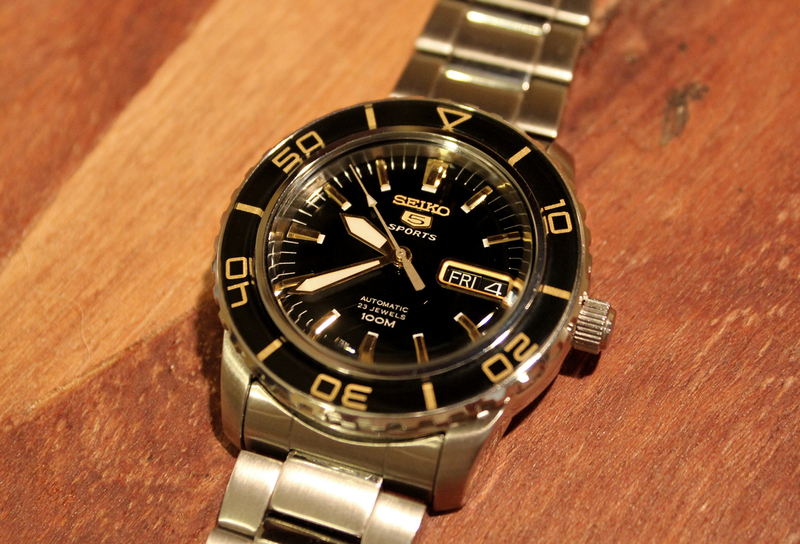 Seiko 5 SNZH57 pays homage to the Fifty Fathoms, for which modern analog dive watches owe a debt of gratitude. With its domed Hardlex crystal, deep chested case, and Hardlex-protected bezel, the Seiko 5 SNZH57 bears a resemblance to the original Blancpain, so much so that modders have been buying aftermarket Fifty Fathoms-style dials and turning Seiko SNZH’s into replicas of the pioneering submersible timepiece. 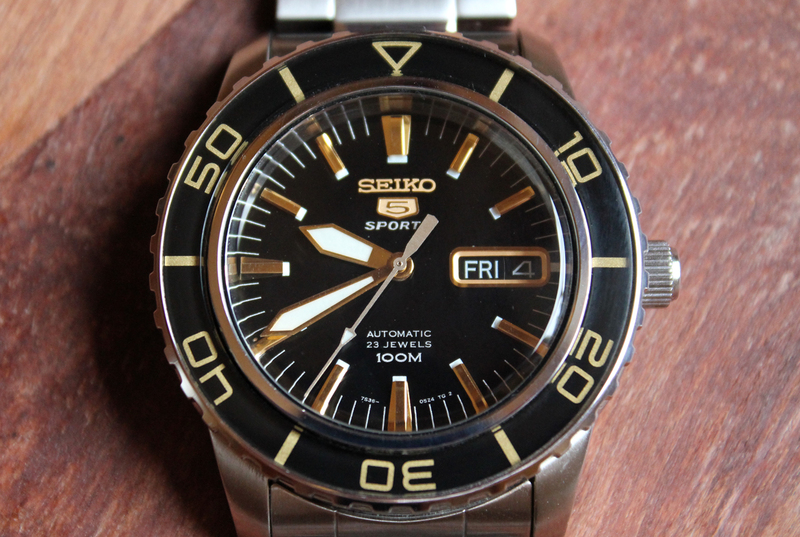 These modified Seiko watches avoid copyright infringement by changing the dial lettering to read “Fifty Five Fathoms” and omitting any reference to Blancpain. Other replica watches are sold in the Fifty Fathoms likeness, but, because of the illegalities of producing exact copies, they are not as much homage as whoremage in my estimation. Of the variations in the SNZH series, I chose the brushed and polished stainless case and stainless band with gold accents. The watch just looked right to me. There are black dial and bezel, blue dial and black bezel, white dial, gold case and gold band, and blacked-out stealth models in this series. At 43mm X 14 mm, the case is not too large. It rides well on my average-sized wrist. The watch’s moderate heft reminds you that you are wearing a substantial watch, but this is a sensation I rather like. The band on this watch is sturdy and relatively quiet, with a fold-over clasp and double push button safety. 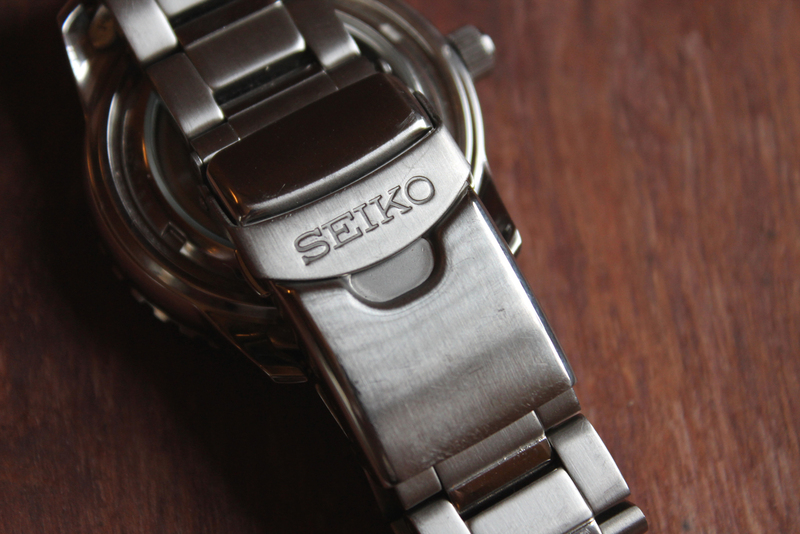 The SNZH’s use Seiko’s 7s36C 23 jewel automatic movement, which is made in Malaysia (not Japan). Mine is accurate to a +-2 seconds per day average by my testing. I am fine with that. It does not have a hack function. A screwdown Hardlex display case back allows you to view the magic in the case. The 120 click unidirectional bezel is positive and not easy to accidentally rotate. 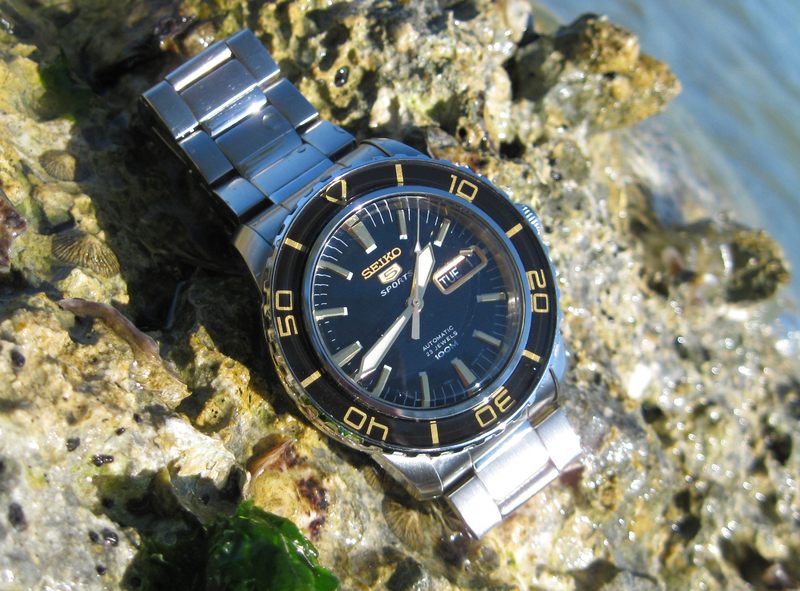 Though the SNZH is purported to be water resistant to 100 meters, it lacks the screw down crown of a true diver. Not a problem for me, as I only snorkel or swim occasionally, but that may be a deal breaker for those who actually scuba. Original Fifty Fathoms did not have screw down crowns, but incorporated double rubber O-ring seals at the stem. That was because of patent restrictions at the time. I’ve aged to half a century, so my vision is deteriorating. Despite this, I have absolutely no trouble reading the wide luminous hands of the SNZH. The lume on the hands is good, but not outstanding. I occasionally have to squint at the watch to find the hands if I have been out in the night for very long. This entry was posted in Watches and tagged Blancpain, Dive Watch, Fifty Fathoms Watch, Seiko, Seiko SNZH, Seiko SNZH57. Bookmark the permalink. 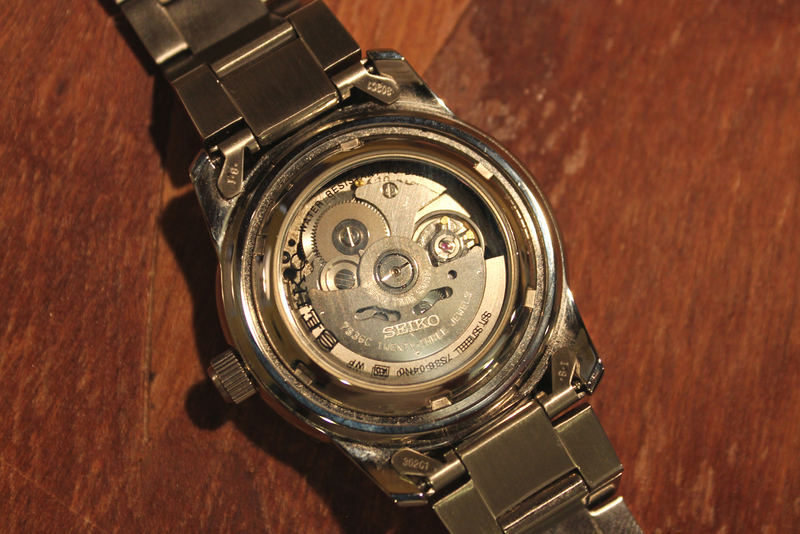 The one I recently bougth manufactured in 2010 Dec uses a S736B movement as etched on the rotor. I wonder why the inconsistency. I just bought one, and was wondering how was the bracelet? I am thinking that I would like a more sturdy bracelet, do you know of any good ones that would fit this model well? Patrick, I like the bracelet just fine. Give it a chance before you go looking for a replacement. I agree with Patrick, the bracelet seems flimsy and cheap. Robert, the prices go up and down on Amazon, so sometimes I’ll wait until it is low. I’ve also used Blue Dial in the past. This watch could easily be £500 and it would still be a good buy. It looks and feels expensive.